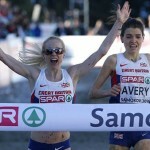 Zurich 2014 – In a career that has spanned more than two decades, Britain’s Jo Pavey has won Gold at the European Athletics Championships to make history. Here in the Letzigrund Stadium, the 40-year-old mother-of-two achieved what will surely be the crowning moment of her career as she deployed all her experience and sheer guts in the 10,000m to go one better than her European silver medal of four years ago. Ten days after taking Commonwealth 5000m bronze, Pavey had secured another place on a major championship podium – the best place of all. And in doing so she became the oldest ever female to win a European gold, taking that distinction from Russia’s Lyubov Gurina, who won the 800m in 1994 aged 37. “It’s hard to believe,” she said, her voice still clearly signalling her birthplace in Devon. “I don’t really know how I was able to win it at this age. It feels like I might be dreaming or something. As she broke the resistance of her final challenger, France’s Clemence Calvin, over the last 80 metres, there was nothing but pain and determination on the Briton’s face. After so many near misses she was not to be denied here. Having crossed the line she stood as if dazed for a few moments, with both arms out. When she found the strength to acknowledge the crowd’s approbation it was with more of a grimace than a smile. But as she embarked upon a mazy lap of honour, with the British flag draped over her shoulders, the joy came through. And there could be more joy to come.